But here’s the analogy…we are the man. Life is like the dog, taking unexpected turns. That is why we say “keep your eyes on the prize”. Look at the progress the pair made down the beach, not the individual aberrations of the dogs path, or even the individual steps of the man. That isn’t to say, the steps don’t need some attention and, more importantly intent on the part of the man. As we walk along the beach, we make choices and set our intentions. We can either walk toward our goal with purpose, or get pulled off course by every bump and bobble life brings. I have a hunch that a good life – a good walk on the beach has a bit of both. If we just walk in a regimented straight line, we might miss pretty shells, better paths not evident at the outset, all kinds of nifty stuff. By the same token if we meander all over the place with no attention or focus at all, we never get down the beach or to where we intended to go. On the other hand, if we already know we are on a not-so-hot direction or in a not-so-great place in life, this card is a reminder to follow the leash…get back to a more cosmic perspective, to go back to a middle road, go find somebody who knows where the heck they’re going – do SOME thing to regain your bearings, which MOST of the time has to do with getting a bigger picture view. Look at the problem from the perspective of, well, the Cosmos. 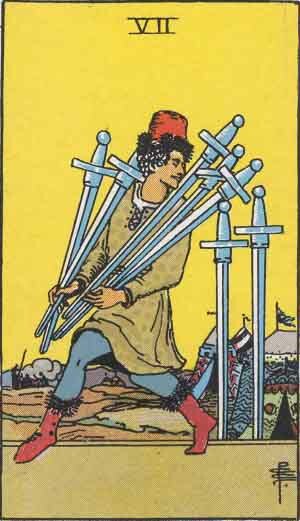 Think of it as the seven swords pointing toward the tower…the tower being a way to find the bigger perspective needed when things seem lost or chaotic. If you are a Cosmos fan, or see the beautiful side of science…I suggest checking out www.symphonyofscience.com. My favorite is “We Are All Connected”. Thanks to poet/photographer/artist Sahm King for cluing me into the awesome. Previous Post Who said you need to fit in?